Special offer! Free shipping on all DVD orders to the U.S. and Canada! 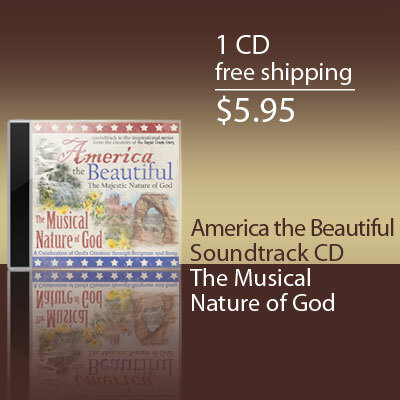 Set of three DVDs and one CD includes the entire "America the Beautiful: The Majestic Nature of God" collection featuring "Canyonlands of the Southwest," "Falling Water and Rising Earth," "Blossoms, Bees and Butterflies," and the soundtrack CD "The Musical Nature of God." Reflect upon the mystery and wonder of the spectacular rock formations that populate the canyons of the American west. From high mountain peaks to the depths of massive winding canyons, the wonders of Creation are presented with scripture and music to provide a resource that you can re-visit again and again as you seek inspiration or desire a time of quiet meditation. After a fruitless search for relaxing, inspiring nature DVDs free of new age music or narration with an evolutionary slant, a team of filmmakers set out to photograph for themselves the rarely seen and often overlooked intricate details of God's glorious creation. 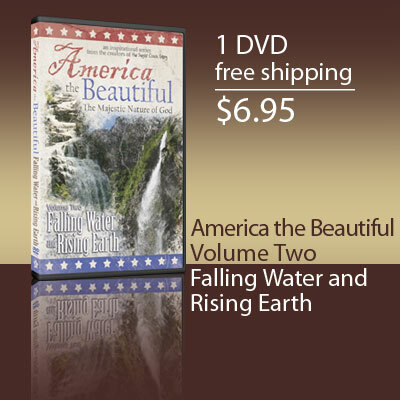 The result of their efforts is a powerful new DVD series titled America the Beautiful: The Marvelous Nature of God. Experience the pure serenity of a gently winding mountain stream and the unimaginable power of stunning waterfalls. From high mountain peaks to the depths of massive winding canyons, the wonders of Creation are presented with scripture and music to provide a resource that you can re-visit again and again as you seek inspiration or desire a time of quiet meditation. Marvel at the intricate details of wildflowers and the animals that thrive among the blooms. From high mountain peaks to the depths of massive winding canyons, the wonders of Creation are presented with scripture and music to provide a resource that you can re-visit again and again as you seek inspiration or desire a time of quiet meditation. Scripture readings and the sounds of nature are intertwined with completely new arrangements of classic hymns as featured throughout the America the Beautiful: The Marvelous Nature of God series. Just like the DVD series, this soundtrack provides a resource that you can re-visit again and again as you seek inspiration or desire a time of quiet meditation.